Santa Barbara had the second hottest summer ever recorded in 2016, its soaring temperatures matching much of the world. Rising water, stronger hurricanes, larger variations in temperature, and lengthened growing seasons are all a part of the changing climate that has been occurring across the world. While the list of changes are known to us in a vague sense, what does it really mean for everyday life? 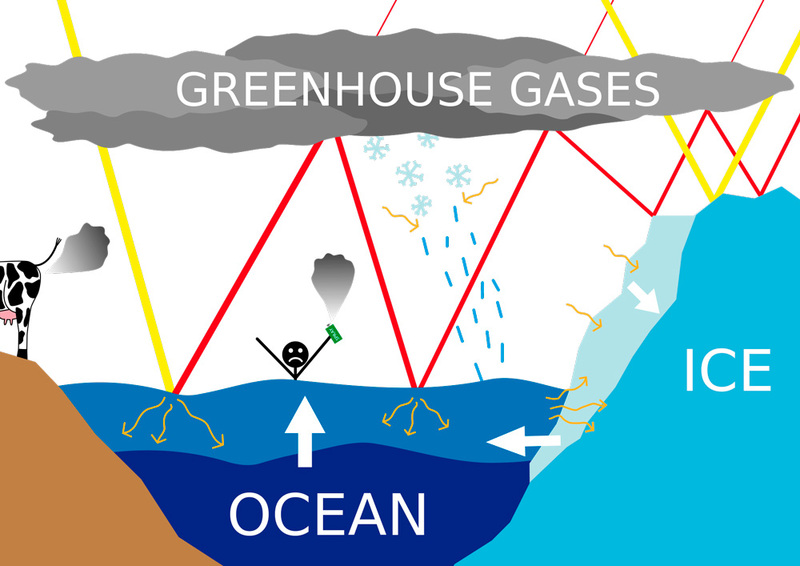 Climate change is the result of an increased greenhouse effect, meaning that the increase of certain particles in our atmosphere have been getting trapped for longer periods of time. While some particles being trapped is a good thing because it keeps us from freezing to death, there has never been an increase in greenhouse gasses as fast as there has been these last two hundred years. For Santa Barbara, this means that the beaches will start disappearing and cliffs along the coast will start eroding at a faster rate. According to NASA, sea levels will rise anywhere between one and four feet by 2100 and will not stop rising for centuries after that. It has already risen about eight inches since reliable statistics have been recorded. For places like the Maldives, a small nation of scattered islands in the middle of the Indian Ocean, this means that they will be put under water. At maximum height the Maldives don’t reach ten feet above sea level. If sea levels rise four feet, most of the island’s population will be living partially underwater because of tides. According to the Guardian, scientists estimate that up to 150 million people will have to move to other countries due to environmental degradation by 2050, namely due to a lack of fresh water and increases in the instability of resources. With an increase in temperature in the Santa Barbara, the changing of rain and snowfall could affect the way that we get our energy. The county’s website estimated that 16 percent of Santa Barbara’s energy comes from hydroelectric power. With the decrease in water availability, we still need to provide energy for a rising population. According to the Santa Barbara County Association of Governments, there will be approximately 90,000 more people in the county by 2040. Even worse than Santa Barbara, what do these changes mean for the planet? With changing weather patterns, sea ice is in a volatile state. Sea ice in the Arctic and Antarctic is the native environment for many species. With the ice melting, these populations have insufficient food, leading to starvation. The National Wildlife Federation stated that even when polar bears survive their forced fasts, there has been an increase in cannibalism of cubs by the male bears. This in turn leads to a decrease in any potential population stability. Not only are polar bears losing hunting grounds with the temperature increases in and near the Arctic, humans are also increasing the pressure. Oil fields previously unattainable because of ice in the arctic are being drilled, allowing for disturbances to the habitat and its destruction, with the potential of oil spills, according to NWF. So, for your New Year’s resolution, there are many ways to lower your warming impact for 2017.